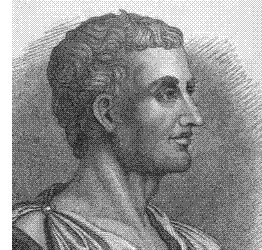 Livy (59 B.C.-17 A.D.) - One of Rome's great historians, Livy (or Titus Livius) lived at a time when literacy was at or near its highest point and writing was voluminous in Roman society. He wrote a history of Rome called "Books on the Foundation of the City" (official name in Latin, Ab Urbe Condita Libri), over the course of about 40 years, consisting of 142 books (35 of which survive). The work is a full history, dating back well before Rome's traditional founding of 753 B.C. and concluding with the reign of Augustus. So comprehensive was his work that it came to be considered the definitive history of Rome in his own time. Livy is also a primary source for the Second Punic War.